Hi friends. I'm Gyan Ranjan. I'll give you a live cricket score and Pakistan vs South Africa 2019 5th ODI highlights. 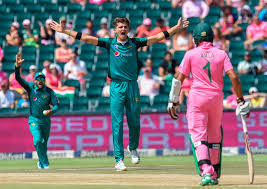 Preview and full scorecard of this Pak vs SA 5th ODI Pakistan tour of South Africa 2019 are also available in this post. Imam ul Haq, Fakkar Zaman, Babar Azam, Mohammad Hafeez, Shoaib Malik(c), Mohammad Rizwan(wk), Imad Washim, Shadab Khan, Mohammad Amir, Usman Khan, Shaheen Afridi. This is a final and a series decider match of this ODI series. Because of both the teams have had won the 2-2 matches before this 5th and last ODI. Pakistan won 1st ODI and 4th ODI but lost 2nd ODI. and the 3rd ODI(DLS). There are so many crickets series have been played in this season. Such as India tour of New Zealand, Sri Lanka tour of Australia, Pakistan tour of South Africa and England tour of West Indies 2019. All the teams are preparing them for Cricket World Cup 2019. Get cricket news and live score of all the matches of all the series in this blog. South Africa won the toss and opt to bowl first in this series decider match. Fakhar Zaman played a great inning of 70 runs for Pakistan. He smashed 10 boundaries in his inning. Imad Wasim 47 and Shoaib Malik contributed with 31 runs. But other batsmen of Pakistan dissatisfied its followers. Pakistan could score 240/8 in 50 overs in Pakistan vs South Africa 2019 5th ODI. Dwaine Pretorius and Andile Phehlukawayo got the 2-2 wickets. While Dale Styne, Willem Mulder, and Kagiso Rabada got the 1-1 wicket each. Shoaib Malik run-out due to the best combination of Styne, Pretorius and Quinton de Kock. Quinton de Kock played the great inning for South Africa. He played an inning of 83 runs. He smashed 11 boundaries and 3 sixes in his inning of 83 runs. Know the performance of both the teams in this Pakistan vs South Africa 2019 5th ODI highlight which is a series decider match. South Africa is on the way to win this match and series. South Africa 161/3 in 25 overs. Faf du Plessis and Rassie van der Dussen also played the innings of the 50-50 runs. South Africa achieved the winning target of 241 runs in 40 overs for the loss of 3 wickets. Hence South Africa won this Pakistan vs South Africa 2019 5th ODI by 7 wickets. And also won this series by 3-2. Share and write your valuable comments. It will be helpful to develop this blog according to your need and interest.